How quickly things change on social media. Just a few years ago, video on these platforms was all about the short and sweet: creators were told to focus mainly on “snackable” pieces that could be consumed quickly. Today, the hot new thing is long-form video. Last year, Facebook reportedly spent up to $1 billion on lengthier content and Google dedicated hundreds of millions of dollars to original YouTube programming; Twitter has invested heavily in live video streams, especially from sports leagues; Snapchat now has shows from major media companies; and Instagram got into the game last year with its IGTV offering. What’s going on? 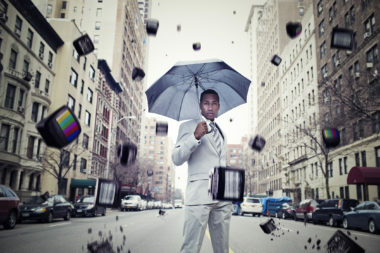 Why are social platforms pushing shows and other long-form content? 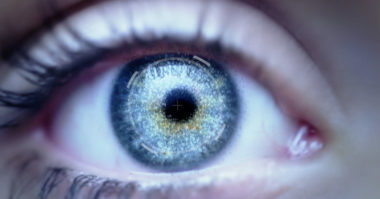 Are consumers watching? Are advertisers interested? Is social set to dethrone television and platforms like Netflix in the coming years? 1. Why Are Social Platforms Focused on Long-Form? Why are social networks embracing long-form video? In part, because over the past few years this type of content has been proven to work online. According to ThinkNow Research data cited by eMarketer, some 61% of adult Americans say they now watch shows on Netflix, 33% on Amazon Prime Video, and 24% on Hulu. This demonstrates that a sizable share of people have become used to watching lengthier digital pieces. 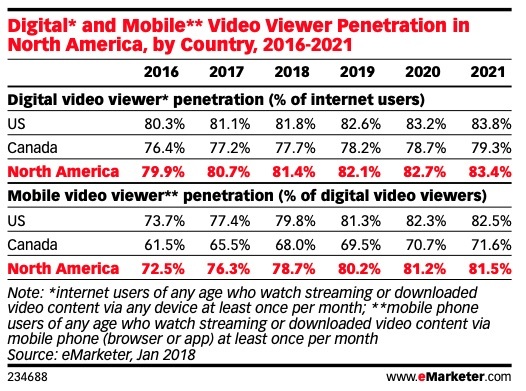 More broadly, watching online video, especially on mobile devices, is becoming central to the lives of consumers: eMarketer estimates that 84% of Internet users will be frequent watchers of digital video content by 2021 and 83% will be using mobile devices to watch video content. This means that there will be an ever-growing hunger for digital video in the coming years. 2. Does Money Have Something to Do with the Shift? Of course, social networks aren’t diving into long-firm video simply because they see a potential for engaging audiences. The larger opportunity, at least from a business perspective, is to garner a larger share of spend from advertisers. 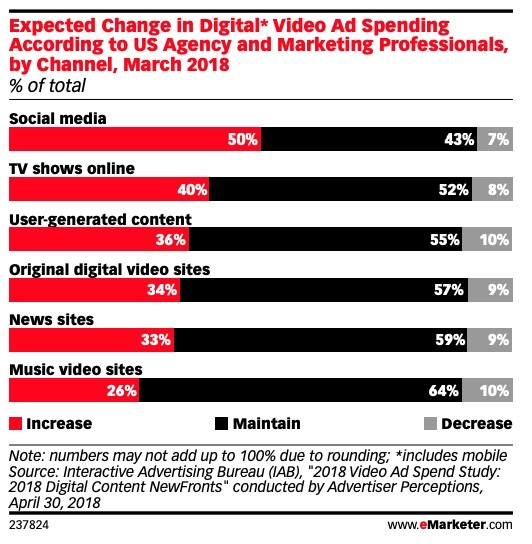 According to IAB data, as cited by eMarketer, half of agency and marketing professionals plan to increase their spend on social media videos in the near future and 40% plan to increase their spend on TV shows online. Given that, expanding into long-form video solves two problems for the platforms: it opens up additional inventory for brands looking to advertise via video on social media and it entices marketers looking to advertise via online TV shows. 3. Are People Willing to Watch Longer Videos on Social? The shift to long-form video clearly makes sense for the social platforms, but is it actually what audiences want? After years of being conditioned to expect short clips on various networks, are people open to lengthier content on social? The answer appears to be—at least right now—that younger audiences are much more ready for this evolution compared with older audiences. 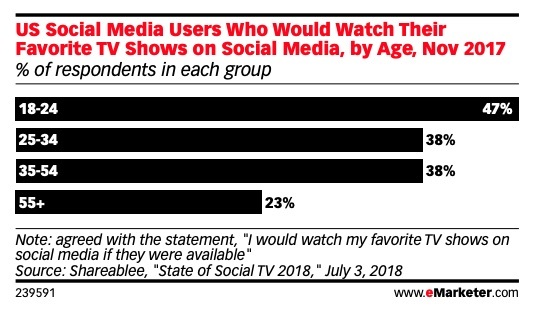 According to a Shareablee survey cited by eMarketer, some 47% of social media users in the US ages 18–24 say they would watch their favorite television shows on social media. This compares with 38% of social media users ages 25–54 and just 23% of social media users age 55+. 4. So, Is Long-form Succeeding on Social Now? So, what’s the current state of the social networks’ strategies? Have audiences started to embrace long-form video on the platforms? 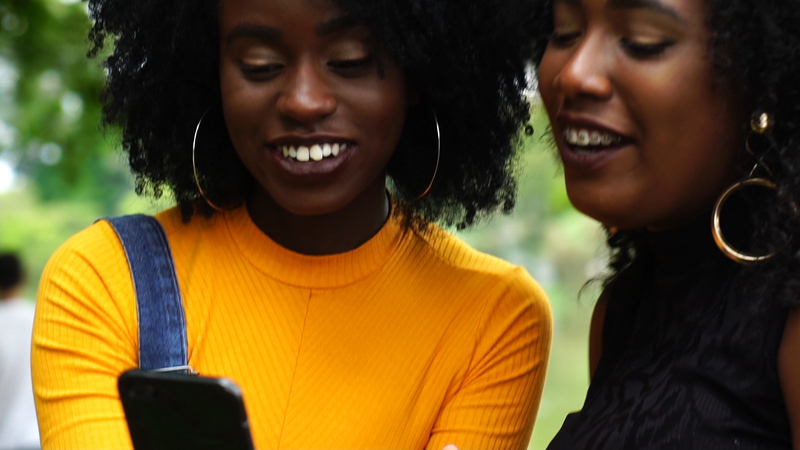 The shift toward video content overall has clearly been a success: according to a Cowen and Company survey, as cited by eMarketer, among US social media users, 51% now watch video on Facebook, 48% watch on Instagram, and 30% watch on Twitter. The status of long-form pieces is harder to discern. 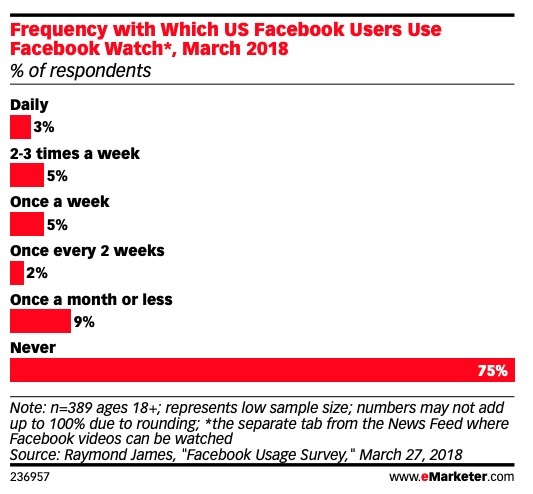 A Morgan Stanley AlphaWise survey, as cited by eMarketer, found that 40% of US Facebook users age 16+ say they now view Facebook Watch content weekly. However, a Raymond James survey found that three-quarters of US Facebook users say they never view Facebook Watch content. 5.Will Long-Form Succeed on Social in the Long Run? Given that long-form pieces on social media are relatively new, the more pessimistic estimates on current viewing behavior could very well be correct. It’s very likely that audiences have not yet fully embraced this sort of content. However, that doesn’t mean that they won’t. 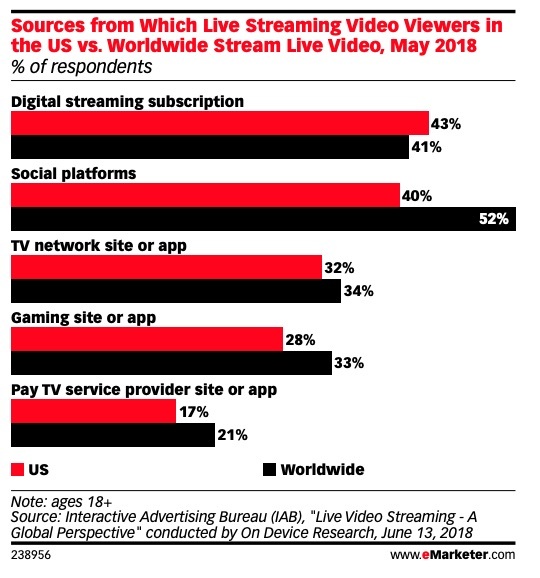 An IAB survey, as cited by eMarketer, found that while only 40% of US consumers now stream live video on social platforms, 52% of consumers worldwide do so. In other words, at the moment there may be a gap between current behavior in America and what audiences are open to. So, what should marketers make of all this? The key takeaway is that while long-form video on social media may experience some growing pains in the short run, it’s primed to be hugely important in the long run. There are number of underlying factors—ongoing evolutions in audience behaviors, the rise of younger consumers, increasing advertiser demand, etc.—which indicate that the shift toward lengthier pieces on social media is here to stay, not just a passing fad. Ultimately, while shows on social may not be fully there yet, they likely will become very big, very soon. Learn more about the impact of video on social media marketing. Contact MDG Advertising today at 561-338-7797 or visit mdgadvertising.com. MDG Advertising, a full-service advertising agency with offices in Boca Raton and Brooklyn, New York, is one of Florida’s top branding firms. MDG’s capabilities include print advertising, direct mail marketing, branding, logo design, creative, media buying and planning, radio and TV advertising, outdoor, newspaper, digital marketing, website design and development, online video advertising, infographic development, email marketing, video marketing, mobile marketing, content marketing, social media marketing, paid search marketing, and SEO. To learn about the latest trends in advertising and branding, contact MDG Advertising today at 561-338-7797 or visit mdgadvertising.com.